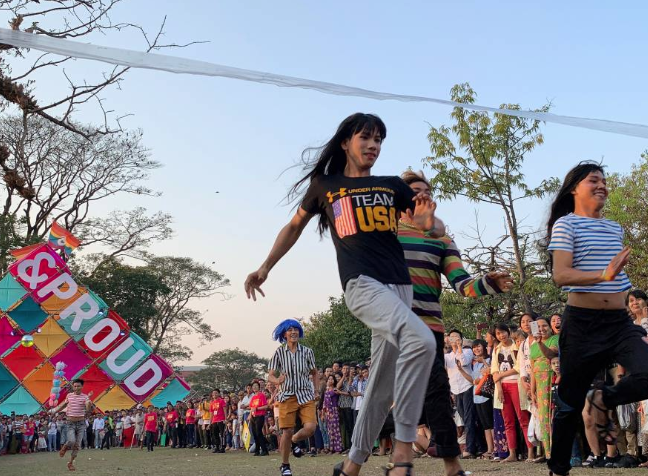 (Reuters) – Contestants ran a stiletto race, and swirled hula-hoops at a park in Myanmar’s biggest city on Sunday in the Drag Olympics, as a highlight of the Yangon Pride festival. The attendance of an estimated 2,000 people at the Thakin Mya Park was a sign of change in a predominantly Buddhist country, where traditionalism is strong, and homosexuality is a crime under a law inherited from British colonialists, organizers said. It was the fifth time that the festival has been held, but only the second year it has happened in a public place. “When we started this, people did not really dare to come to this kind of festival”, said Hla Mat Tun, a co-director of the festival from the &Proud group. “Now you see a lot of young people. Young people are more proud and out and encouraged and empowered”. But he said LGBT people continued to face harassment, and that social change was needed as well as changes to Myanmar’s laws. Activists complain that progress has not been as swift as they would have hoped, under Myanmar’s transition to democracy. The government has also faced heavy international criticism, after a 2017 army crackdown led hundreds of thousands of minority Rohingya Muslims to flee to neighboring Bangladesh. Cheered on by the crowd, nine contestants took part in the Drag Olympics, which also involved a handbag flinging contest, before the judges picked a winner.